Read the entered KMP files (text or binary), of needed load the related KCL file, draw KMP objects and create an OBJ file. The default destination is '%P/%N.kmp.obj'. Automated dropping of bad KCL triangles is enabled if no drop option is specified by option --kcl. -w --draw list The parameter is a comma separated list of keywords to select the elements to draw. Allowed keywords are: CKPT, CJGPT, JGPT, KTPT, ENPT, ITPT, POTI, CNPT, ITEMBOXES, COINS, ROADOBJECTS, SOLIDOBJECTS, DECORATION, BLACK, WHITE, KCL, NONE and ALL (default); the classes POINTS, OBJECTS and RESPAWN; the presence-flag selectors [1-3]OFFLINE and [1-3]ONLINE; the special options DETAILED, DISPATCH and WARNINGS. If a keyword is prefixed by a minus sign, the option is disabled. Option KCL decides, if the reference KCL is included in the output. If DETAILED is disabled, an output with less faces is created. If DISPATCH is enabled, the settings of dispatch points are visualized. If WARNINGS is enabled, some objects are drawn in red. --pos-file file Load a position file created by mkw-ana and print the positions into the map. Define the modes first, because the last defined modes set by --pos-mode are used! --png pix_size ['a' align] ['x' x1[:x2]] ['y' y1[:y2]] ['t' types] Draw a PNG with a top view of the track instead of an OBJ file. Transformations are done after the KMP 3D drawing, but before PNG creation. 'pix_size' is the number of world units (sqare) used for 1 PNG pixel. 'align' is a factor as anti-aliasing pixel multiplicator (>1 is on). 'x' and 'y' defines the part of the world that is displayed. If not set, the check points (KMP/CKPT) are used to find a good area. 't' is a bit field with 32 bits to enable the the KCL types. Each bit corresponds to one of the KCL types and only . The default is to display all but not walls and solid fall (0x7fef0bff). All numeric values can be any expression allowed by the parser. 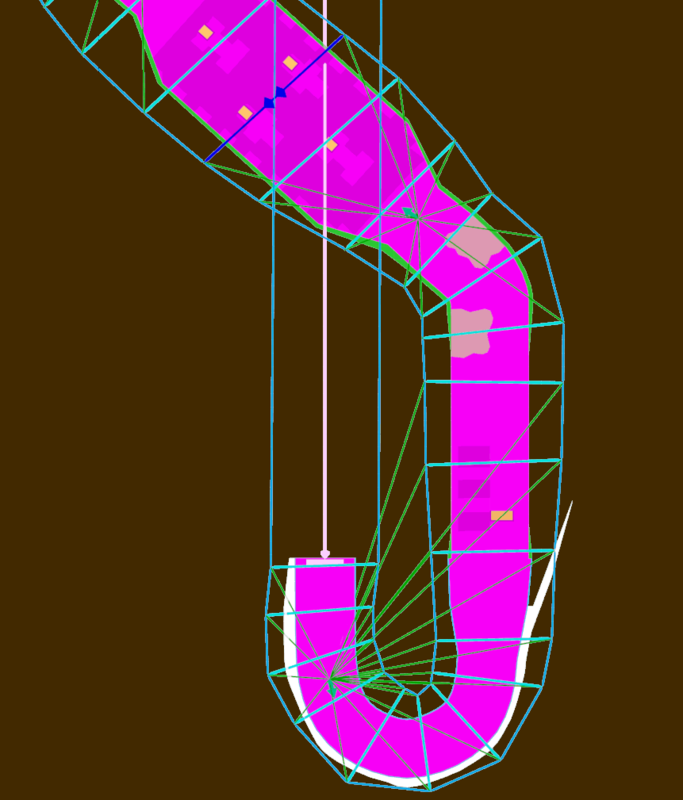 The command DRAW draws KMP objects and points into an internal 3D object list and export it as a Wavefront OBJ file. The output can be combined with a KCL as reference. The command is also known as COBJECT (Create OBJECT). This old command name can still be used. The third example shows a part of DK Summit as non perspective top view. It shows the cannon, the check points, the respawn points and the relation between check and respawn points. 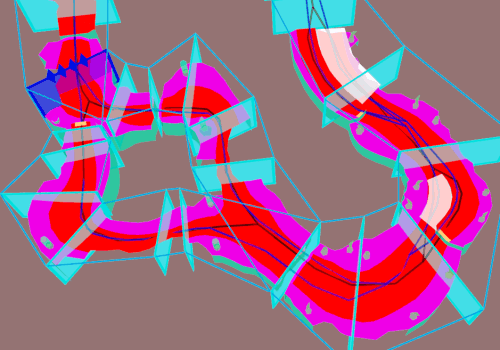 It was created with: wkmpt draw boardcross_course.szs --draw -enpt,-itpt. Option »--draw -enpt,-itpt« means: Draw all, but not enemy and item routes. The parameter is a comma separated list of keywords to select the elements to draw. Allowed keywords are: CKPT, CJGPT, JGPT, KTPT, ENPT, ITPT, POTI, CNPT, ITEMBOXES, COINS, ROADOBJECTS, SOLIDOBJECTS, DECORATION, BLACK, WHITE, KCL, NONE and ALL (default); the classes POINTS, OBJECTS and RESPAWN; the presence-flag selectors [1-3]OFFLINE and [1-3]ONLINE; the special options DETAILED, DISPATCH and WARNINGS. If a keyword is prefixed by a minus sign, the option is disabled. Option KCL decides, if the reference KCL is included in the output. If DETAILED is disabled, an output with less faces is created. If DISPATCH is enabled, the settings of dispatch points are visualized. If WARNINGS is enabled, some objects are drawn in red. This option decides, which elements are included into the Wavefront OBJ file. As parameter a comma separated list with keywords is expected. Most keywords can be prefixed by a minus sign to disable the option. If the very first character of the list is a minus sign, the options are initialized with ALL,DETAILED,WARNINGS to allow an explicit deactivation. Otherwise the list the list is initialized with NONE,DETAILED,WARNINGS. The general default is ALL,DETAILED,WARNINGS. ENPT Draw the enemy routes of KMP sections ENPT and ENPH with respect to junctions. Each step of every route is drawn as a blue prisma (line) from one point to the next. Option DETAILED has impact to the presentation. ITPT Draw the item routes of KMP section ITPT and ITPH with respect to junctions. Each step of every route is drawn as a red prisma (line) from one point to the next. Option DETAILED has impact to the presentation. CKPT Draw the check points of KMP section CKPT and CKPH. All checkpoints are drawn as blue and cyan gates with a solid border and a transparent wall. The lap count, mandatory and standard check points are drawn with different styles and colors. The IDs of the mandatory check points are also visible (number of visual objects at the top border). The check points are joint together to make the routes and junctions visible. Like navigation lights, a dark red is used for the left side and a dark green for the right side. If WARNING is set, invalid check point quadrilaterals (not convex or corner distance to small) are drawn in light red. CJGPT CJGPT is only active, if CKPT is also set: Draw 2 green lines from the check point top corners to the related respawn point. JGPT Draw each respawn point as green arrow pointing to the defined direction and as a rectangle, that covers the respawn area. The tip of the arrow is the defined position. Option DETAILED has impact to the presentation. KTPT Draw each start position as black arrow pointing to the defined direction and as a rectangle, that covers the starting area. The tip of the arrow is the defined position. The length of the rectangle depends on the narrow flag of section STGI. Option DETAILED has impact to the presentation. PTS PTS is a short cut for all single points (points, that not part of a route). At the moment it is the same as JGPT,KTPT. RESPAWN Include all, that is needed to review respawn points. RESPAWN includes CKPT,CJGPT,JGPT,KTPT,KCL. CNPT Find cannon points in the KCL and estimate the landing zone by analysing the KMP section CNPT. The calculation interpretes also the x- and y-rotation values to find the landing zone. Draw a mangenta cube at the landing zone and a mangenta arrow as direct way from the cannon shoot point to the landing zone. Option DETAILED has impact to the presentation. POTI Draw the routes defined by the POTI section with respect to the cyclic flag. Each step of every route is drawn as a green prisma (line) from one point to the next. 4 different green colors are used for the routes. 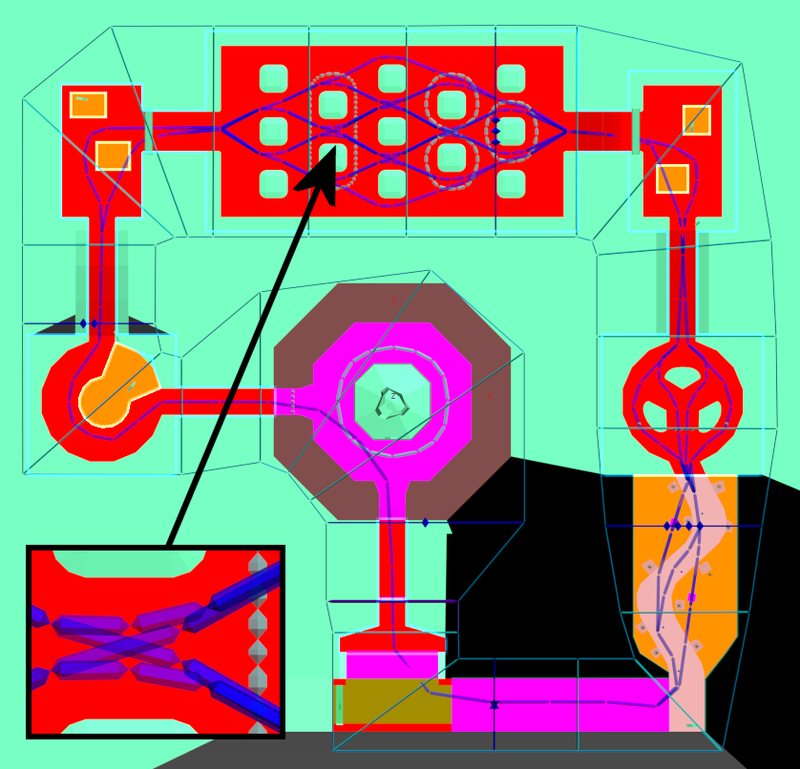 Special colors are used for routes used by ITEMBOXES or SOLIDOBJECTS. ITEMBOXES Draw each standard itembox (GOBJ ID 0x65) like in-game as a grey cube with a vertex down. The color for itemboxes with special items for players or enemies is dark grey. For itemboxes with routes, the routes are drawn as grey/green prisma lines. COINS Draw each coin (GOBJ ID 0x73) as golden cubus. ROADOBJECTS This class is available since v1.46. SOLIDOBJECTS Draw each solid global object (section GOBJ), that not have a route and is not part of ROADOBJECTS. For some objects (see below) an internal database holds an info about format, color and size of the objects. All other object are drawn as dark blue octahedron. At the moment the following objects are drawn with correct size and recognizable form and color: itembox, obakeblockSFC*, dokan*, karehayama and all trees. For solid objects with routes, the routes are drawn as cyan prisma lines. DECORATION Draw each unsolid global object (section GOBJ), that not have a route and is not part of ROADOBJECTS. At the moment only the following objects are drawn: WLscreenGC. GOBJ This is a short cut for all supported global objects. At the moment it is the same as ITEMBOXES,ROADOBJECTS,SOLIDOBJECTS,DECORATION. 3ONLINE Each keyword represents one flag of the GOBJ presence flag. If at least one bit is set, then only objects are drawn, if the correspondent presence flag is set. OFFLINE Short cut for 1OFFLINE,2OFFLINE,3OFFLINE. ONLINE Short cut for 1ONLINE,2ONLINE,3ONLINE. WHITE Insert a black (very dark grey) or white (very bright grey) rectangle at height 0.0. The rectangle covers all other valid points. BLACK has priority over WHITE. KCL Include the KCL data to the OBJ output. Different KCL types are drawn in different colors. NONE Disable all of above. This is a start point for a positive list. ALL Enable all of above. This is a start point for a negative list. DETAILED This option is independent of NONE and ALL. If set (the default), then the lines are drawn with many faces to get a good view. If disabled, the tool reduces the number of used faces for most KMP elements. DISPATCH This option is independent of NONE and ALL. If set, 2 octahedrons are inserted for each dispatch point. The settings of the group are visualized by colors: The left octahedron is printed with 8 colors for settings 1 (values 0..7). The right octahedron is printed with 4 colors for settings 2 (values 0x00, 0x40, 0x80, 0xc0). Additional, a octahedron list of all colors is inserted at the bottom right. WARNINGS This option is independent of NONE and ALL. If set (the default), invalid check point quadrilaterals (not convex or corner distance to small) are drawn in red. Other warnings may follow.